Story: Earliest knowledge of Deadlock is that he joined the Four June 1989. He was captured by Youngblood marts 1992, and attempted to escape from prison may 1992 [1,7]. Deadlock was killed trying to escape and reanimated by Project: Born Again for Bloodstrike . 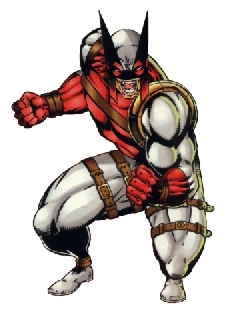 The reanimation process changed his psychological profile making it possible for Noble, the leader of Bloodstrike, to change Deadlock's identity . He was a part of Bloodstrike until he was destroyed by Quantum along with the rest of Bloodstrike, marking the end of Bloodstrike as a strike team . When he was resurrected by Mars Gunther , they had used Nu-gene radiation (the mutagenic properties of the Nu-gene converted into radiation) and revived his dead tissue meaning he became alive instead of undead as was normally the case in resurrection. Contrary to Cabbot Stone his treatment has some complications, which meant he had to take repeated radiation treatments to survive . Deadlock was last seen when he was destroyed fighting Epiphany . According to Mars Gunther he has been revived as a clone and send into hiding . Skills & abilities: Deadlock is a homicidal maniac with animalistic urges and a preference for women. Vampiric tendencies have been suggested .